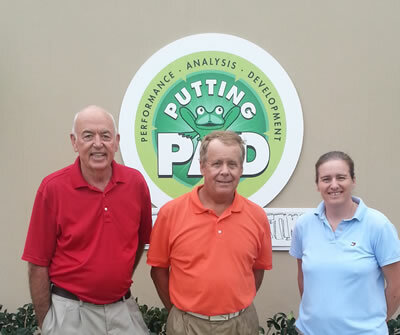 Minnesota based PGA professional and CPI graduate Larry Murphy of Moorhead Country Club, Moorhead, stopped by the Frankly Putting PAD at Reunion Resort during a recent visit to Florida. Valerie Melvin, CPI Course co-creator had the chance to ask him a few questions and find out how his CPI qualification was working for him. VM: Larry, how did you enjoy the CPI course? LM: I found the CPI course to be enlightening. I have been in the business a long time and have been teaching golf for most of my life. I would say that the CPI course is the most enjoyable course I have taken. VM: How would you say it has helped your business? LM: I have never marketed only putting lessons. Before taking the CPI course I would give my students an occasional putting tip or hint, but very rarely a full putting lesson. However, after completing the course and using the marketing ideas and materials that are included, I found that my members were coming to me asking for putting lessons. This happened immediately after announcing my new CPI qualification in the club newsletter and placing a poster on the locker room noticeboards, creating an entirely new revenue center for my business. The qualification makes me a credible putting instructor and having just started last year, I anticipate that there will be a domino effect this year as the word continues to spread. VM: I am so glad that the course has helped. Is there anything else you would like to add? LM: Yes I certainly would; the principles of the course are easy to follow and apply when giving a lesson. I can watch a student putt and make changes that will help them putt better immediately. There is a great feeling of satisfaction when I see their eyes light up during a lesson and have reported a significant improvement in their putting on the course. They now understand what it is they should be doing, and approach their putting completely differently. The CPI course has been a real eye opener for both me and my students.